There was an exciting buzz in the air last Sunday evening in the 150-year old heritage building belonging to Webster University Leiden, as Leiden Vice-Mayor Martine Leewis handed out the awards to the best teams. 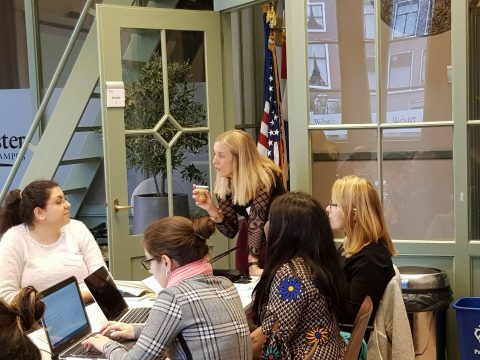 Nearly one year in the planning, the WBII, in collaboration with the Digital Leadership Institute (DLI) in Brussels, Webster Leiden Campus, the Women Entrepreneurship Platform (Brussels), Google, Ataro Food & Spices, and many other partners and friends, were so pleased to hold a first in the Netherlands — a digital skills event for female starters. Some 30 women students and professionals participated in the Move It Forward – Female Digital Starter Weekend workshops, learning how to launch an e-business in the cloud, build a website and app, and hone their skills in Search Engine Optimization and e-marketing. In addition, over 10 professionals, including trainers, coaches, jury members, and support staff, and a crew of 4 outstanding students, ensured that all aspects of the event were covered. Menocompass – a project to provide support for women going through menopause — Overall Best. Recipes Abroad – startup to provide expats with information about spices and ingredients — Most impact. Here-She-Is – a project to support deeper and more meaningful connections between women — Most innovative. 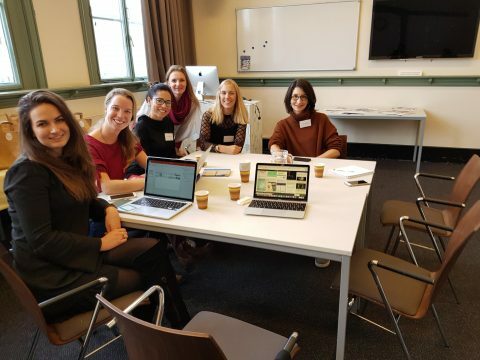 “Thank you again for this unique opportunity of Women’s Business Initiative at Webster University Leiden. Keynote Speaker, WBII Member, and Webster graduate Ebere Akadiri, owner of Ataro Food & Spices, reflected on her own efforts to launch her website and connect with her audience by using social media. She eloquently encouraged the participants to first identify their passion and vision when building their business idea, and look for what makes themselves special. 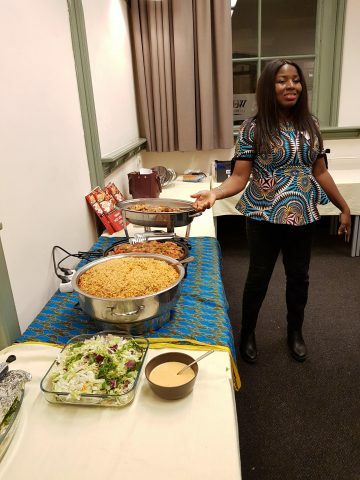 Akadiri also sponsored the delicious Saturday evening dinner, which featured dishes prepared from recipes in her West African cuisine cookbook. With her idea for the project Recipes Abroad, her team won the award for the Project with the Most Impact. Ron Lemeij, of Eisenfelt Academy and coach at the PLNT incubator in Leiden, led a workshop for the teams on how to ‘Pitch without a Glitch’. Pim de Bokx – Chairman of the Dutch Incubator Association, and Sandrine Shuman, Adjunct Professor at Webster, also supported the teams as coaches. Projects were juried by a group of 4 highly respected professionals, including: Marcel de Lijster – Experienced teacher, trainer, local government official, and Rabobank professional; Tara Velis, Venture Manager at the Webster PLNT incubator; Snezana Zivcevska-Stalpers – Project Manager for IBM, and UN Woman Champion for Change; and Mary Sobiechowski, Experienced CIO and global IT transformation leader and Partner with Fortium Partners in New York. Participants told us that they were moved by the history behind the Webster Leiden campus building. In fact, Webster’s classes are held in a building that is a designated heritage property dating from 1869, and originally built and used as a girls’ school. Team members said that they felt a special connection to the building when they were working on their projects, due to its history and relationship to girls. Milena Milankovics said that the Webster University building “…made this event even more special and gave me an extra motivation to ‘move women’s issues forward”.